Hassan Whiteside is one of the more intriguing players in this draft, and you can see why from his situations statistics. With a usage of 12.8 possessions per-game that ranks him just above average, Whiteside scored on a very solid 56.8% of his overall touches and turned the ball over at a low 13% rate. Whiteside received just 27% of his touches in the post, one of the lowest marks on our center rankings. Despite that fact, he scored 61.1% of those touches, good for third on our list. He was fouled on 16.1% of those shots, ranking him second. Whiteside was able to make a nice impact on the block despite his lack of lower body strength, showing a nice hook shot and unique touch for a player his age. Outside of the post, Whiteside used his length to generate 2.9 possessions per-game from offensive rebounds (3rd). Showing impressive versatility, 26% of Whitesides shot were jumpers, the top mark in our sample. Making 40% of those shots and finishing at a highly respective 64.1% clip, Whiteside is one of the most unique talents in this draft. His ability to score from the outside at his height is incredible, he was one of the most impressive shot blockers in the NCAA last season, and shows the potential to score in multiple situations. The freakiest measurements of all belong to Hassan Whiteside. The soon-to-be 21-year-old freshman bafflingly elected to arrive for measurements in flip-flops (a true story), which only gave him an additional inch in shoes (6-10 ½ without shoes, 6-11 ½ with)as opposed to Cole Aldrich who gained 2 ¼ inches. With that said, he possesses one of the longest wingspans in NBA pre-draft camp history at 7-7. Three months after posting our initial impressions of Hassan Whitesides freshman season (our first scouting report on him actually came back in 2008), the dust has settled and has allowed us a much clearer picture of his strengths and weaknesses. Whiteside has emerged about as quickly as a prospect can when looking at where he was this time last yeara raw, rail-thin, anonymous big man coming off the bench in prep school, committed to play for a small Conference USA team in West Virginia. Whiteside faced significant question marks regarding his ability to even get eligible at Marshall from an academic standpoint, and was not receiving very much attention from the recruiting services. Fast-forward a year and Whiteside is fresh off being named C-USAs top freshman and defensive player of the year, after leading the NCAA in blocked shots. Hes elevated his NBA draft stock significantly in the process, to the point that hes being mentioned by many as a potential lottery pick and perhaps even higher. Whiteside has progressed notably as the season moved on, seeing increased playing time and shouldering a bigger share of the offensive load for Marshall. Though he remains largely an unpolished prospect, particularly in terms of his footwork, post-moves and decision making ability, he shows flashes of potential in many different areas, namely his ability to put the ball on the floor, knock down mid-range jumpers and utilize his tremendous length to score inside. Extremely aggressive looking to make things happen on the offensive end, Whiteside gets to the free throw line at an excellent rate, converting 60% of his attempts once there, and does an outstanding job of crashing the offensive glass and finishing around the rim. He has very good touch around the basket, as well as from the perimeter (even knocking down a couple of 3-pointers this season), clearly showing better scoring instincts than your typically raw mid-major big man. The terrific extension he gets around the rim, excellent shooting mechanics and high-release point on his turnaround jumper all leave plenty of room for optimism regarding his offensive potential once hes able to fill out his lanky frame a bit. Whitesides weaknesses as a prospect are often just as glaring as his strengths. His main issue revolves around his extremely underdeveloped frame, which hinders him on the offensive end, but more importantly makes him a constant target for post-up plays and renders him an exceptionally poor man to man defender against average college big men. Whiteside gives up deep position in the post with the greatest of ease--seemingly not even fighting back at times-- getting out of his stance quickly, bringing his hands down, and downright giving up on plays, thinking hell simply be able to recover and come up with a block, which at this level can indeed be the case on occasion. As a weak-side shot-blocker its an entirely different story, though, as indicated by the fact that he led the entire NCAA in this category on both a per-game and per-minute basis, which is extremely impressive considering the stage of development hes currently at. Whiteside possesses freakish lengthhis wingspan is reportedly around 7-6and he has absolutely terrific timing rotating, contesting and rejecting shots. Hes one of the most productive rebounders in college basketball for these same reasons. One of Whitesides biggest problems lies in his extremely poor passing ability. Playing 851 minutes on the season, Whiteside has dished out only 9 assists, a shockingly low number that ranks him amongst the worst in college basketball in that area. Watching him play, its clear that once he touches the ball, he sees nothing besides the rim, often forcing up extremely poor shots and having major issues dealing with double teams, which makes him very turnover prone. Whitesides fundamentals, basketball IQ and overall awareness are well below average, even considering his freshman status. He at times looks out of place in Marshalls half-court offense, looking as if hes not quite sure where he should be at any particular moment, which at this late stage in the season makes you wonder about his ability to process an NBA teams far more complex playbook. Whiteside had a very difficult time qualifying academically for college, only actually getting into school at age 20, and is reportedly having problems staying eligible now that hes already there, which will likely leave him no choice but to enter this years draft. Immature is the word you hear most often associated with Whiteside both on and off the court, as there will certainly be a large degree of hand-holding and coddling that whichever team drafts him needs to do in order to help him reach his full potential. There are major questions about his work ethic and intensity level, which is a bit concerning considering how far off he currently is from being able to contribute to an NBA team. We also need to keep in mind that despite his freshman status, hes the same age as many college juniors, turning 21 this upcoming June. This obviously limits his upside to a certain degree. Despite the numerous red-flags and his clear-cut project status, Whiteside is an extremely interesting prospect thanks to his rare physical tools and super intriguing skill-level. At a certain point in the draft, the reward of picking him definitely outweighs the risk, as were obviously dealing with a special talent. NBA teams will need to do quite a bit of research into his background and psychological makeup, and figure out how much physical potential his frame has in terms of being able to add weight. Whiteside is clearly the type of guy that needs to go to the right organization, as he could easily get lost in the shuffle and find himself out of the NBA if he lands in the wrong place. An unheralded high school recruit coming off the bench at Marshall, Hassan Whiteside probably isnt on the radar of many people yet, but as conference season approaches, that is likely to change. Whiteside already has one near triple-double under his belt, putting up a monstrous 14 point, 17 rebound, 9 block performance in just 29 minutes against Ohio, and hes had a few other good games as well. Hes yet to play much noteworthy competition, but appears to have all the tools to replicate his performance against C-USA foes. Standing 611 with excellent length and great athleticism, Whiteside is an extremely intriguing physical prospect, theoretically having the tools to effectively multiple positions at the next level. Since the first time we saw him a little over a year ago at a prep tournament, hes added some weight to his frame, but still could stand to add significant lower and upper body strength in the near future, both of which could help his game substantially. Offensively, Whiteside shows flashes of skills in multiple areas, but he is very unpolished in all of them, and is still pretty much a blank slate in terms of what type of offensive player he could become. He shows glimpses of a nice hook shot in the post, but lacks the footwork to get it off consistently. He can take his man off the dribble from 15 feet using his rangy steps in a straight line motion, but cant do much else. He will occasionally knock down a spot-up 15 footer, but just as frequently will put up an air-ball. His disastrous 10-for-29 showing from the free throw line thus far is probably pretty good evidence as to where his jump shot is overall. The fact that hes getting there so often in limited playing time is a very good sign for the future, though. What Whiteside does do well on offense, though, is finishing off the ball and crashing the offensive glass, relying on his physical tools to do so. Hes a good finisher around the basket, but could be better if he had the upper body strength to finish through contact and the lower body strength to more easily power up without gathering himself. His ability to finish on finesse lay-ups could also be better, as his touch appears just adequate. One area where Whiteside doesnt appear to be utilized much is finishing on pick-and-rolls. This is something his skill-set and physical attributes are perfect for, and is an area we hope to see more of in the future. Despite his limitations, Whiteside is already scoring at a very nice rate for a college freshman, and is doing so efficiently as well, shooting nearly 64% from the field. Defensively, Whiteside has incredible potential, and is already a force in multiple ways. In addition to having excellent length and mobility, Whiteside possesses outstanding timing on his shot blocks, and does a pretty good job with making rotations from the weakside. He blocks shots in all situations, be it coming across the lane on a driver, in man-to-man situations in the post, or running out on the perimeter to swat down jumpers. He averages an astounding 8.2 blocks per-40 minutes pace adjusted, which ranks him 2nd overall amongst all NBA draft prospects in college basketball, behind only Jarvis Varnado, who will go down as one of the best shot-blockers in NCAA history. Another strong aspect of Whitesides defensive game is his lateral quickness, being able to hold his own when switched onto perimeter players in pick-and-roll situations, while also having a pretty solid fundamental stance. His post defense is a bit lackluster, however, as he doesnt utilize his length as well as he could, and he lacks the lower body strength to consistently hold his position. As a rebounder, Whiteside has been extremely prolific thus far this season, averaging nearly 15-rebounds per-40 minutes pace adjusted, which ranks him amongst the NCAA leaders in our database in that category. Looking forward, its way too early to come to any definitive conclusions about Whitesides game, but its clear that we are talking about an extremely intriguing long-term prospect. Matchups with North Carolina, West Virginia, and all of Conference USA loom on the horizon, which should give us plenty more instances to evaluate his game against worthy competition. He is definitely someone to keep on the radar from an NBA perspective, but how soon or to what degree is yet to be determined. It should be mentioned that he is about two years older than most players in his class, as he turns 21 in June. Hassan Whiteside (unranked Scout, Rivals, ESPN) is someone we saw and wrote about just a few weeks earlier, but his performance here was so strong that something had to be written to acknowledge it. Whiteside had a tremendous impact in his teams game, scoring 9 points with 12 rebounds and 7 blocks, while contesting a handful more shots as well. You dont find many players at the high school level with his combination of size, athleticism and freakish length, which makes him an extremely intriguing long-term prospect. Whiteside hasn't done much to expand his game skill-wise, but he approached the game with a more focused and active demeanor here, making his present felt on both ends of the floor. With his excellent length, mobility, and quickness in getting off the floor, Whiteside is a huge threat on the defensive end, where he roamed the lane swatting shots all day, also stepping out on the perimeter for a couple blocks as well. He combines good timing and anticipation with his excellent physical tools to make him a huge presence in the middle. Offensively, Whiteside didn't do much creating here, but was active attacking the glass and cutting to the basket, showing the willingness to take advantage of his physical tools, such as on one play where he strongly dunked over an opposing big man while also drawing the foul. Whiteside could still do some more to add offensive skills to his game, and he can add some bulk to his thin frame, but he looks like a steal and a half for Marshall, assuming he receives academic eligibility, which is a question at this point based on some reports. 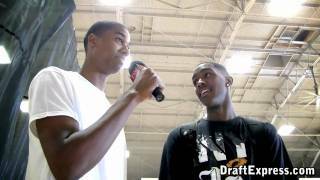 Hassan Whiteside (unranked Rivals, unranked Scout, unranked ESPN) was one of the pleasant surprises of the showcase, playing far beyond the average ranking that he has been given by the recruiting services. With the package of raw skills, physical gifts, and upside down the road, it's easy to tell why Donnie Jones and Co. landed a steal in Whiteside. Physically, Whiteside has great size for a center at a legit 6'11 with a very long wingspan. Still a bit on the skinny side at 225 pounds, he possesses a wide frame that could surely add a considerable amount of muscle. Appearing relatively coordinated for a player of his stature, he shows good lateral quickness and fluidity in movement for a player his size. Toss in his above average leaping with ability to get up and down the court and you have all of the athletic makings of a bigtime prospect. Whiteside is a relatively versatile, but unpolished player on the offensive end. He gives you glimpses of the ability to score both inside and out, but doesn't have a set go-to move. In the pivot, he tends to opt for a right handed hook shot that he releases with high extension. With the senior's footwork on the blocks being undeveloped at this time, it's difficult for him to have much more in his post repertoire. Another area of concern is Whiteside's ability to finish with contact inside, which he struggled with this past weekend in Rhode Island. Not just a back to the basket player, Hassan also showed some intriguing skills on the perimeter. Displaying a soft touch all the way out to the collegiate three point line, he has a jumper with a high release point and pretty nice form. Whiteside also showed off decent ball handling skills when attacking the rim and was usually able to beat opposing centers off of the dribble. While it's nice of a player of his size to have skills like this, it should be noted that Hassan's ultimate position is unquestionably at center for the next level. Defensively, the North Carolina native teamed with Rashanti Harris to create one of the more imposing front lines on this end of the court. With his long arms, leaping ability, and strong lower body, he was able to block a number of a shots without getting in foul trouble. Getting on the glass was not a concern with Whiteside, although there were some occasional lapses in effort defensively throughout the games we observed. There is a considerable amount of long term potential for Whiteside in the future if he continues to develop and put forth effort throughout his collegiate career. The Marshall staff did an outstanding job of locking up this big man and he could potentially be an impact player in Conference USA early in his career. There have been some academic concerns with Whiteside, but he appears to be on the right track towards getting qualified for next season.